The last few Special Purpose Local Option Sales Tax (SPLOST) referendums passed by Coffee County voters have included funds for the Economic Development Authority. Most recently, funds were allocated for the development of two industrial parks, including one on property purchased with $1.8 million raised through a capital campaign, says Taylor. Adding infrastructure to a second Perimeter West Industrial Park is also ongoing, she says, boosted by a 2016 $500,000 OneGeorgia grant, which uses funds from the state’s Tobacco Master Settlement Agreement to partner with rural communities in economic development. “Until a few years ago when we did that capital campaign, we were really out of inventory,” says Taylor. The county’s diverse industry base includes agriculture, poultry processing, distribution and logistics, and what Taylor refers to as a “niche industry,” the cargo trailer industry. Most mobile home manufacturers in Coffee County went out of business a decade ago, but about a half dozen have since found success as manufacturers of lightweight, enclosed cargo trailers for hauling equipment, vehicles, etc. 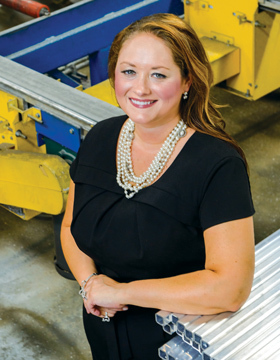 Also on the grow is Elixir Extrusions, a manufacturer of aluminum extrusions and fabrication, which announced mid-year plans for creating 100 jobs in a new anodizing facility it is constructing so it can anodize its own products rather than sending them elsewhere for the process, says Taylor. Elixir purchased land from the development authority and is investing $8 million in the project. “Those are high-quality, well-paying jobs, higher than the average for this area,” she says of the new positions. Eighteen months after opening its doors, Premium Peanut, which bills itself as the largest peanut shelling operation in the world, announced plans this summer for a couple of expansions. A $14-million investment will be used to construct a filtered crude peanut oil facility, and Premium will soon move to a year-round 24/7 shelling schedule. Together the expansions will add 80 positions to the current roster of 115. A job fair held over the summer brought 400 applicants in a single day for those new positions, says Taylor, whose chamber facility hosted the event. The peanut oil facility is slated for completion by March 2018. Premium, a grower-owned facility that combined seven South Georgia peanut buying points, began operations in January 2016. Since then, another two buying points were added with a 10th scheduled to be added in 2018, says Lee Taylor. Last year saw completion of a 65,000-square-foot expansion to the Coffee County campus of Wiregrass Georgia Technical College (WGTC), where mobile buildings had been housing the overflow for some time. The expansion included the county’s new career academy, which had about 200 kids enrolled this past year, says Brandy Wilkes, associate vice president for academic affairs. A $3-million grant from the Technical College System of Georgia paid for the career academy. WGTC itself enrolled 850 students in fall 2016, she adds, up substantially from the previous fall. Allied health remains the most popular offering, driven in part by a strong partnership with Coffee Regional Medical Center. The emergency medical technician (EMT) program recently became a full-time offering, and diesel mechanics and machine tool technology were also added last year, all in response to feedback from area business and industry. Another example of WGTC’s efforts to partner locally to provide a qualified workforce is the program at the CoreCivic correctional facility in Nicholls, Ga., that provides training in diesel mechanics and welding to incarcerated students who meet college entry requirements. The program recently completed its first year, and more than 60 students were trained in these two fields, both of which have excellent job outlooks in the state. Students who leave the facility with these certifications are better equipped to obtain stable employment, reducing the chances that they will return to prison, says Wilkes. Enrollment is also up at South Georgia State College – now under the leadership of veteran college administrator Ingrid Thompson-Sellers – where 2,500 were enrolled in associate and bachelor degree programs last fall from 102 Georgia counties and 365 high schools. The college also operates a campus in Waycross. Thompson-Sellers says they’re exploring the addition of three bachelor’s degrees in education, allied health and technical/engineering. Founded in 1902, the college has an economic impact on the surrounding community of $65.3 million annually, as determined by a study commissioned in 2015 by the University System of Georgia, she says. The college’s entry program partnerships with Valdosta State University and Georgia Southwestern State University allow students to complete developmental studies and required high school curriculum, then enter one of the universities as a sophomore once they’ve earned 30 credit hours of college core curriculum while maintaining a 2.0 GPA. While the county has always focused on recruiting industry to the area, there is more attention these days on attracting new retail. Among those efforts is a project of The Jones Co. of Waycross, which purchased a prime piece of property for the creation of a retail development. The Plaza is slated to open in early 2019, says Taylor. Included in Coffee’s most recent SPLOST were renovations to the county courthouse and the construction of a $12-million centralized sports complex for use by the community and the high school, says Douglas City Manager Terrell Jacobs. Phase I, slated for completion by 2019, includes three football fields, four baseball/softball fields, a batting and pitching cage, a concession stand, bleachers, score-boards, lighting, a playground, a half-mile paved walking trail and additional parking, says Jacobs. Mayor Tony Paulk was elected to a four-year term in November 2015. His focus these days is on reducing the city’s footprint with regard to property. The city plans to renovate and expand city hall to “make it a little bit more modern and customer friendly and to incorporate numerous offices in one location, sort of the one-stop shopping,” says the Douglas native who previously served as mayor in 2004. They’re also relocating city services such as maintenance, public works and utilities to a single location outside of the city limits, opening up three to five properties the city hopes to market and sell at fair market price. For 30 years, Douglas has been a Main Street City, designated by the Georgia program that assists economic development and community revitalization. Douglas is currently focused on bringing housing to the downtown area by encouraging property owners to consider renovating existing buildings for lofts. Main Street is also working toward renovating and updating downtown streetscapes, says Pattie Merritt, program coordinator. In addition to overseeing the Main Street Program, Merritt also heads tourism efforts, promoting such attractions as General Coffee State Park, the Heritage Station Museum and the World War II Flight Training Museum, the most intact of the remaining flight schools, she says. Between 5,000 and 10,000 cadets trained there during World War II and for years have returned for an annual reunion. “Unfortunately, we’re now down to about five who are able to visit,” says Merritt, regarding what is likely to be the last year for the reunion. With these and other projects creating buzz, Coffee County is living up to its mantra. It’s hard to believe that there exists a 10-foot waterfall in Georgia’s Lower Coastal Plain, but you can find one in northeast Coffee County’s Broxton Rocks Preserve. So rare and special is the property that it’s overseen by The Nature Conservancy. In fact, Broxton Rocks is full of anomalies. In addition to the falls, the site also includes rare pitcher plant seepage bogs and the single largest outcrop of sandstone (about four miles long) in the Atlantic Coastal Plain, dating from the Middle Miocene era, 5 million to 23 million years ago. Threatened or endangered species are among the roughly 530 plant species here, some once thought to be extinct. They include both filmy and shoestring ferns as well as Georgia plume, green-fly orchid and silky creeping morning glory. In fact 22 species here are considered rare, including the largest and only protected population of the rare succulent herb grit portulaca, an otherwise Cuban species. Centuries of erosion have carved fractures and cave-like recesses in the sandstone, creating the perfect environment for much of the thriving flora and fauna, including about 100 bird species. The longleaf pine ecosystem that is home to the preserve is being restored by The Nature Conservancy. The site is open by appointment, with very few exceptions. Hikers can access a one-mile trail that extends from the preserve gate to the falls during the months of June, July and August. The entire preserve opens to the public every Easter Sunday and on select dates for tours and work parties. Jim Cottingham, retired now from South Georgia College as a professor of education and psychology and former vice president of student affairs, grew up visiting Broxton Rocks and taking groups of scouts there before it became a preserve. Today he serves as a tour guide for the spring and fall trips, averaging 15 to 20 visitors, many seeing the site for the first time. “[Visitors] range from families coming in from here and there and a smattering of locals and then from most any place in the state,” he says. “I think the whole thing is just an incredible natural diversity. The unique plant and animal associations are just really marvelous,” says Cottingham.